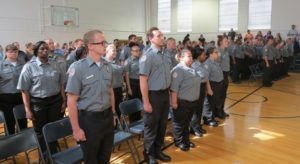 On Friday, (April 12, 2019) the Tennessee Department of Correction (TDOC) welcomed new correctional officers into the workforce during a graduation ceremony at the Tennessee Correction Academy in Tullahoma, Tennessee. The ceremony celebrated the hard work of 51 Correctional Officers who will be serving the citizens of Tennessee by working in prisons across the state. During their weeks of training, the class learned skills that will assist them in being effective correctional officers. Classes on leadership, effective listening and interviewing techniques, teamwork and defense skills were taught during the six-week academy. The graduates will return to their respective facilities where they will be assigned a facility-based mentor. During the mentorship period, the officers will apply their newfound skills to the prison environment with the goal of enhancing public safety.